Every horse tells a story. 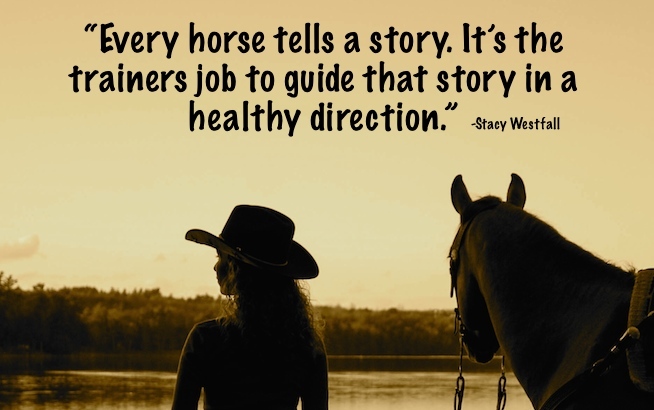 It’s the trainers job to guide that story in a healthy direction. Every horse tells a story. Their own story, their own way that they view the world. Young horses are often easier to read, similar to human children, as they don’t have as many layers of experience or ‘training’. Older horse can be more complicated because they have learned to have certain expectations of people or situations. Their reaction could be a trained response or their true thought on the subject. A trained response could be healthy (good training) or unhealthy (accidental or poor training). 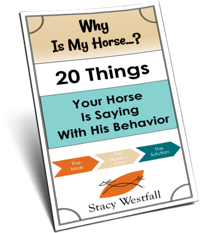 Until the horse is exposed to good training and changes their belief system…their story…they can appear to be inconsistent, challenging and difficult. This is often a reflection of their confusion. It is hard to trust a system that you don’t understand. 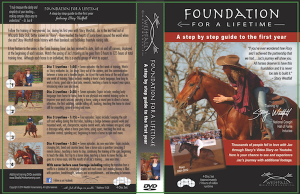 It is up to the trainer to discover the horses true thoughts and guide them in a healthy direction, to help them rewrite their story. Stacy documented the first year of training with Jac…watch is story as it was being written. Four disc set, click photo for more details. ← I’m ill and unable to find a home for my untrained horse, what should I do? Love your perspective (and, I’m delighted to find your blog!). I love working with older horses–I’ve had the opportunity to retrain a couple older horses now, one greenie and one professional bully. 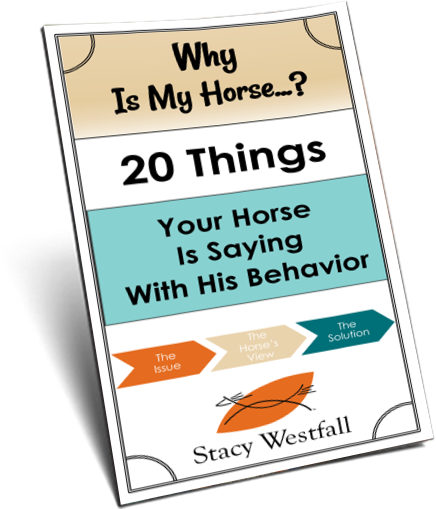 I love their minds, and figuring out how to reshape their presumptions had taught me so much about horses, training, and the world at large. I have mare, 16 yrs old. I have had her for 13 years. She has been worked by 4 trainers and I have done my best to train her with natural horsemanship techniques. She is great in the evening when all of the horses are in their stalls. I can work with her in the isle way and indoor arena, but during the day it has become impossible for me to separate her from the herd. My last attempt ended in her rearing as she was being led and kicking out at me. Now I am going to the pasture and rubbing on her and spraying her with bug dope, and feeding her a carrot. My next step (when I am ready) is haltering her and bringing her into the barn to be groomed and hooves picked. After doing that many times I will work her in the indoor arena during the day when her herd mates are out on grass. She is obsessed with EATING. Comments and suggestions always helpful. Thank you. You are the best! I wish more people looked at working with horses this way. I had my own “challenge” horse, 13yr old TB, ran as a claimer and bounced through different barns (I was owner #13 and he was given to me to just get him out of the barn). Poor guy was a mess and could be rather mean. Took 3 years to get to where we both were consistently on the same page but it was a great experience. Euthanized the big goof in April and while I miss him he made me a better rider, made me look at things differently and I had 10 of the most amazing years working with him and I know the last 10 years of his life he was happy.